Ridiculed for its absurd report on a 0-3 defeat at Manchester City, the Chelsea website authors have once again been writing with their blinkers on. Chelsea striker Diego Costa should have been sent off before Arsenal lost Gabriel for reacting to the Spaniard’s goading when the sides met in the Premier League today. The most squalid part of the little exchange that ended Gabriel’s involvement is that we know enough about Costa’s skulduggery to say for sure that he will probably reflect on what happened as good play. Costa spends so long trying to pick arguments with opponents his credo seems to be that eventually someone will take the bait. More fool Gabriel that he was the one. Yet there is not a great deal to admire about Costa’s behaviour when he resorts to these levels of snideness and, unless Mourinho can tell us otherwise, there seems to be absolutely no desire within the club for him to change. Arsenal’s reduced numbers made their task almost impossible and altered the face of the game. It was all Costa’s doing – and one suspects that, privately, he will be very pleased with himself for that. It began with the Chelsea forward grappling with Koscielny, catching him in the face with a flailing arm. Costa then fell to the ground theatrically, got up and shoved his chest into Koscielny, who also took a tumble. 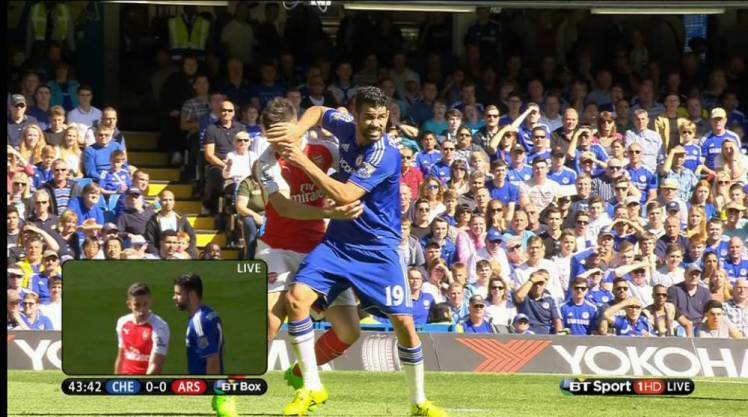 Gabriel got involved, giving Costa a shove, at which point tensions flared between the pair. Let’s be clear. Costa was horrible here: sandpaper made flesh, a blue-shirted jab in the eye and above all lucky not to be sent off himself. It is often said certain players they could start an argument in an empty room. Costa could start an argument alone on a deep space asteroid somewhere past Betelgeuse. He niggled, he provoked, he stopped the flow of the game, he deliberately and skilfully got an opponent sent off. The game was tailor-made for Diego Costa, who was in his element as he baited, goaded, dived, slapped, bitched and whined his merry way through the match – the Chelsea fans gleefully serenading his efforts as he reeled through his entire risible repertoire. After an equal and at times enterprising first half, the Gunners were reduced to 10 men when Gabriel clashed with Diego Costa in the centre circle just before the half-time whistle. The Chelsea forward should himself have been sent off moments before after catching Laurent Koscielny with a forearm to the face as the pair wrestled inside the Arsenal penalty area. Gabriel and Diego Costa were involved in a dispute and came together as they remonstrated with each other. With players from both sides separating the pair, and both men receiving yellow cards, the incident appeared to have been diffused, but the Arsenal defender refused to accept what had gone on and then flicked out at Diego Costa, leaving Mike Dean with no option but to send him off. Mentions of Cost elbowing and slapping Koscielny: none. Why don’t you cry about it? You’re worse than Costa. What do you expect from Chelsea everything about that club is trash. To paraphrase Mourihno after the game: “I didn’t see it on the replays and it was too far away to see in real time”. Thanks – I am beginning to feel more sympathetic to Gabriel. Previously I had thought he had completely lost his head and showed an incredible lack of professionalism. Now I see that most of the press are just as unprofessional and stupid. Go ask questions about Gabriel! Yeah because Costa’s behaviour was SO professional?!? Can we please get this Paul-fella and his melting hot takes off this site? It may generate views, but this kind of “journalism” isn’t the kind of stuff I enjoy this site for. On topic: Costa is lucky to have played for two win-at-all-cost managers in Simeone and Mou. As long as it works more often than not they won’t tell him to cut that crap out. Shame, as he seems a perfecty decent lad off the pitch. I’m hoping this attention to the deliberate, incendiary actions of Diego Costya and the poor refereeing of Mike Dean will have an effect in the future. In years gone by, one or two hard slide tackles would be th cure to deal with a Costa type player. For me, the real concern is the obvious delusional mental health illness of all the new money Cheatski fans. I do hope they are seeing mental health therapists. I can’t disagree with the pettiness in Costa’s game. His goal tally would be like last year if he spent half of that much energy off the ball, but he insists on creating his own demons. The Chelsea write-up nailed a similar theme though, “Gabriel was wound up.” He should have known better than to go anywhere near Costa after he had an earful from him.